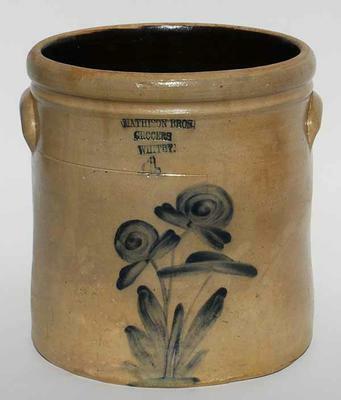 Butter crock made for the Mathison Brothers Grocery in Whitby. Crock was likely made by the Brantford Pottery. Mathison Brothers Grocery was located at 104 Dundas Street West. David Mathison purchased the confectionery and bakery from Richard Snow in about 1889. Mathison operated the business, which also included the production of fine ceramics, until his death in 1924.